Democrats revive climate debate. But can they pass a bill? Democrats face a new question after one of the busiest weeks in years for climate change on Capitol Hill. Already there's been plenty of rhetorical smoke, but no legislative fire. Yesterday, House Democrats named nine members to a new committee on climate change. That was overshadowed a few hours later by the long-awaited rollout of the "Green New Deal," whose progressive touchstones will challenge any lawmaker who tries to translate it into legislative language (Greenwire, Feb. 7). It was a one-two punch that came on the heels of two long hearings that the Democrats, now in control of the House, held Wednesday on the threat of global warming (Climatewire, Feb. 7). None of those efforts gave any indication that Democrats are coalescing around a climate bill, a key test for a party that has made addressing rising temperatures an important part of its political identity. "I think there are going to be a lot of robust conversations over the next few weeks about answering precisely that question," said Rep. Joe Neguse (D-Colo.), a freshman appointee to the new climate committee and a supporter of the "Green New Deal." To be sure, it's still early. The latest legislative session began only a few weeks ago, and most of that time was consumed by the partial government shutdown. At the same time, the political realities remain challenging. Though Democrats won control of the House in November, Republicans still hold the Senate and the White House, making it almost certain that ambitious climate legislation would run aground against GOP opposition. That makes the Democrats' next step hazy. During one hearing Wednesday, Rep. Frank Pallone (D-N.J.), who chairs the Energy and Commerce Committee, said efforts to address global warming could be incorporated into a larger infrastructure package. Rep. Paul Tonko (D-N.Y.), who heads a subcommittee under Pallone, later talked about "low-hanging fruit," such as energy efficiency and grid modernization. He also mentioned long-term plans for a "carbon price solution" (E&E Daily, Feb. 7). Rep. Raúl Grijalva (D-Ariz.), chairman of the Natural Resources Committee, said yesterday that his panel would focus on "mitigation and adaptation strategies more than anything else." "We hope to cobble something together as one major package," he said. Then there's the "Green New Deal." The plan outlined yesterday by Rep. Alexandria Ocasio-Cortez (D-N.Y.) and Sen. Ed Markey (D-Mass.) is only a congressional resolution — meaning that, even if passed, its aspirations would be nonbinding. But it already has significant Democratic support, including a long list of co-sponsors and a handful of 2020 presidential hopefuls. That could put pressure on Democratic leaders to move it, despite its high-flying — and politically challenging — goals such as pursuing "net-zero greenhouse gas emissions" and upgrading "all existing buildings in the United States" for energy efficiency as well as "safety, affordability, comfort and durability." At a press conference yesterday, Ocasio-Cortez said the resolution was a "first step" that would "define the problem and define the scope of the solution." "We're here to say that small, incremental policy solutions are not enough," she said. "They can be part of a solution, but they are not the solution unto itself." Adding to the uncertainty of the Democrats' direction, House Speaker Nancy Pelosi of California might have ruled out a vote on the resolution by Ocasio-Cortez and Markey, The New York Times reported yesterday. Rep. Jim McGovern (D-Mass.) is certain to play a role in whatever climate measure the Democrats attempt to move. 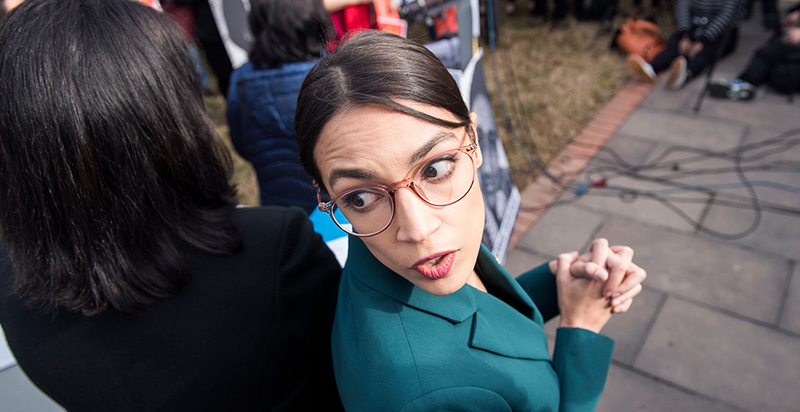 The veteran legislator chairs the Rules Committee, which acts as the House's legislative traffic cop, and he joined Ocasio-Cortez at yesterday's rollout of the "Green New Deal." Asked what piece of climate legislation likely had the fast track, McGovern demurred and said his party should pursue several approaches. "We need to be able to walk and chew gum at the same time," McGovern told E&E News. "We have time to do a lot of different things, and so it's not this over something else. When we're ready to go to the floor [with legislation], we're going to go to the floor."